His fingernails turn into claws, his skin becomes green and he starts breathing fire. 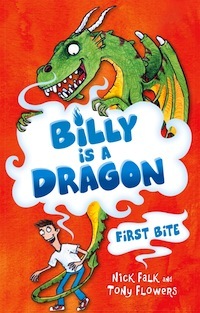 Billy can’t hide it any longer – he’s turning into a dragon. And when his parents decide to sell him to the zoo, Billy has to make a decision. Find a way to change back, or lose his family forever. Being a dragon is more complicated than it sounds!